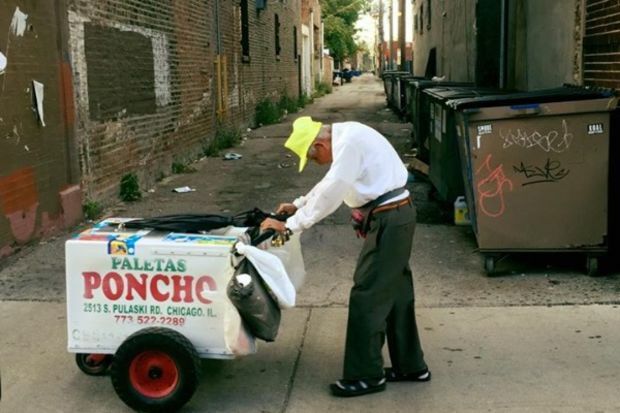 LITTLE VILLAGE — In just two days, a spontaneous online campaign brought in more than $150,000 for an 89-year-old man who's spent decades selling ice cream in Little Village, with nearly 7,000 people donating money toward his retirement. On Monday, he showed up to work anyway. Like almost every day since 1993, Fidencio Sanchez arrived at Paletas Poncho, 2513 S. Pulaski Rd., around 11 a.m. He donned a lime-green cap to shield from the midday sun, grabbed his cart stocked with about 300 frozen treats and went out on the road. 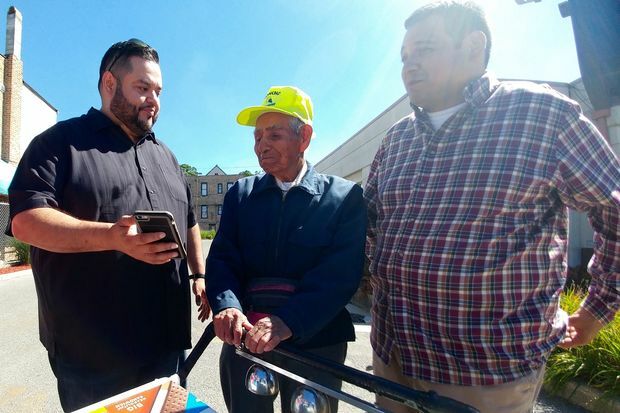 Sanchez typically pushes a cart for a few hours each day, usually taking in about $60, according to Gustavo Gutierrez, co-owner of Paletas Poncho. "I've been doing it all this time, number one, because I like it," Sanchez said Monday. "Number two, because I've been trying to keep supporting myself." Sanchez retired two months ago, intending to "take it easy" and relax with his wife, Gutierrez said. But he returned to work in July, after the death of his only daughter left him with no other way to pay the bills for himself and his ailing wife. "My daughter was like a mother to us," Sanchez said. "She worked every day, she cooked for us every evening and night. We still don't know what to do without her." Joel Cervantes Macias, one of two people behind the fundraising campaign, had never seen Sanchez before last week, when he drove past the small man doubled over his cart on a hot day, he said. "The dude just looked like he was suffering," Cervantes said. "I thought, 'This is a guy who aught to be enjoying retirement.'" Cervantes bought 20 popsicles for $50, but he wanted to do more, he said. He snapped a picture of Sanchez behind his cart and posted it to Facebook, and a flood of comments and messages came back. "That one picture had so much to say, and people really responded to it," Cervantes said of the photo, which showed Sanchez stooping over his cart as he pushed it past a dirty alley in Little Village. "It communicated so many things — poverty, struggle, pride — it's like it spoke more words than any amount of writing could." After seeing the post, Joe Loera, a distant acquaintance of Cervantes, reached out and offered to set up a GoFundMe page to raise money for Sanchez's retirement. "I thought maybe we could raise $200 for him, just to help him out," Loera said. By Monday 10 a.m. Monday morning, the page registered more than $138,000 in donations from more than 6,400 people. An hour later, Cervantes checked his phone again. "We're up to $150,000!" he shouted to Loera, who stared back in disbelief. "It's really just an example of how the global community really does have a lot of love to give," Loera said. "They just need a way to show it." Some of those who gave pointed to the campaign as proof of the underlying care and compassion Chicagoans feel for one another. "What a fantabulous way to prove that Chicago is not just about crime and craziness," one donor wrote. "It's about our roots and helping those in need when they need it most!" After seeing the total raised on Monday, Sanchez said he was "very happy and grateful" to see "such a great surprise." But, he added, he's not ready to hang up his operation quite yet. "Maybe just one more week," he said. Even after taking in so many donations, Guterriez wondered wondered whether the man knew how to stop working. "He's a really hardworking gentleman," Gutierrez said. "He's always giving. He already got the advice from everybody to take it easy and stop doing it. He just doesn't want to. He's like a little kid. He wants to get going." "The man just doesn't get tired," added Blanca Gutierrez, Gustavo Gutierrez's wife and co-owner of Paletas Poncho, on Monday. "I think he wants to be like a tree, and die standing up." Sanchez, who attends the same church every Saturday, learned of the fundraiser at services this weekend, Gustavo Gutierrez said. "... He knows, and he's taking it with a lot of love," Gutierrez said. "We're really for this [support] from the entire community because he deserved it." In a video interview posted on Facebook Saturday, Macias explains that he has opened an account for Sanchez and his wife so they don't have to set it up themselves at the bank, but said they'll have direct access to the money donated from around the globe. Sanchez and his wife Eladia both said in the Facebook video that they value hard work, and don't believe anyone should rely on charity or handouts when they are able to provide for themselves. "We used to be poor farmers," Eladia said in the video. "We came up here to try to make money for our family, to try to send our daughter to high school and give her a future."